In the first years of private practice David Hotson began a long period of collaborations with Yale classmate Maya Lin, acting as the executive architect on a series of projects that she attracted as her Vietnam Veterans Memorial –designed while she was an undergraduate at Yale- was completed to wide acclaim. From these early experiences the office has developed an extensive track record of working in collaboration with artists, designers, and other architects to execute projects with demanding detailing and progressive design values. These have included collaborations with noted architects such as David Adjaye of London, Santiago Calatrava of Valencia and Zurich, Ricardo Legorretta of Mexico City, and other architects, artists, and designers based in the US, the UK, the Netherlands, Germany, France, Spain, Switzerland, Hungary, Armenia, and Japan. The firm’s first major commission in 1991 was as design architect for a golf clubhouse in Osaka Japan working in collaboration with local architect Hayaki Kita. This was followed in 1991 by the Museum for African Art in SoHo, the first of a long series of collaborations with celebrated artist and designer Maya Lin. In 1999, David Hotson collaborated on a loft in Greenwich Village for artist Vincent Mazeau and renown fashion designer Jenna Lyons. This project is described in detail in the section of the website entitled 'a loft in greenwich village'. In 2003 David Hotson collaborated on the renovation of a triplex loft and studio in Tribeca with artist Meghan Boody. In September 2004, United Nations Secretary General Kofi Annan presided over the inauguration of the renovation of the suite of offices immediately behind the main rostrum of the UN General Assembly. The renovated offices -which were the gift of Switzerland upon joining the UN- was a competition-winning design by INLAY, a group of Swiss artists and architects for whom David Hotson Architect was the Executive Architect. This project is described in detail in the section of the website entitled 'a office suite at the United Nations'. In 2004, David Hotson executed an intricate apartment in the Pierre Hotel on Fifth Avenue in an 18th century French taste working with connoisseur designer Michael Simon. The firm served as architect-of-record for the widely noted Greenwich Street Condominiums project designed by New York based Dutch architect Winka Dubbeldam. In 2005, David Hotson acted as architect-of-record on a double-duplex studio building for noted artists Lorna Simpson and James Casabere, which was the first commission in the United States by celebrated British architect David Adjaye. 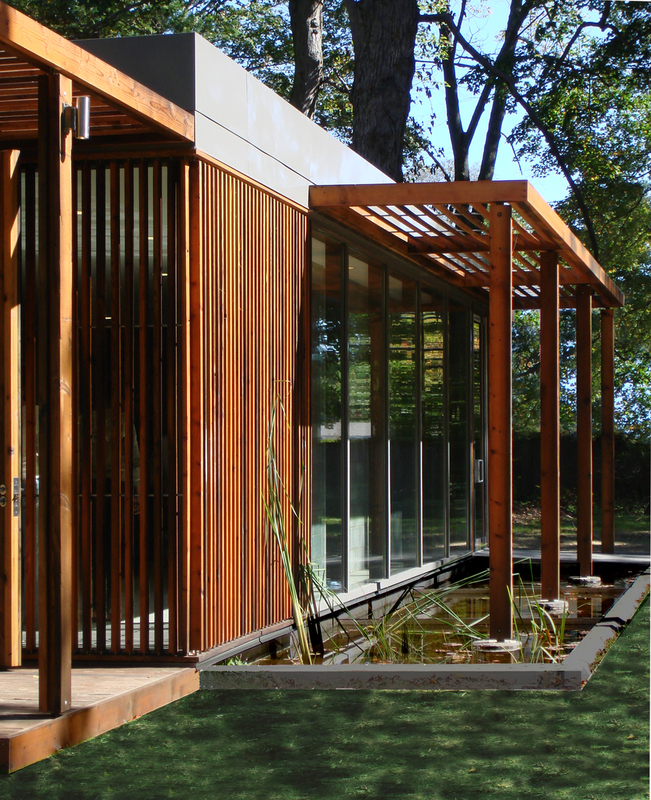 The most recent collaboration with Maya Lin was the Sanctuary Study Center on the Campus of Manhattanville College in Purchase New York, completed in 2006. In 2008, David Hotson completed a duplex penthouse at 15 Central Park West (described in detail elsewhere in this website), working in collaboration with noted Mexican architect Ricardo Legorreta. Throughout the four-story SkyHouse project, David Hotson collaborated extensively in an animated dialogue with celebrated interior designer Ghislaine Viñas.